The rains of late-March causes vegetation in Zimbabwe’s Hwange National Park to sprout and become denser. The lush green season is not regarded an optimal time of year for viewing animals but, despite that, I was optimistic of sightings during a morning game drive. Rising at 5.30 so often feels a difficult, reluctant chore. Yet that was by no means the case as I woke in a tented chalet at the Elephant’s Eye lodge. Excitement at the prospect of viewing wildlife meant I was sitting on the edge of my bed and searching for the gap in the mosquito net by the third ring of my phone’s alarm. The African bush was still enveloped by darkness as I donned my olive equipment vest. Its pockets were packed with batteries, spare memory cards and a notepad: hopefully at least some of the pages would by scrawled with the names of African animal and bird species by the time we returned. Hwange provides habitat to more than 100 different mammals, in excess of 400 bird species, nearly 200 types of grasses and 230 trees: surely even a poor day by local standards would impress a visiting Brit to whom seeing anything other than a cat or dog is out of the ordinary? Southern yellow-billed hornbill on a tree near Hwange National Park. Birds were already chirping when I stepped onto the balcony with the sky lightening to blue. For a moment I hesitated before heading down the steps and walking to the lodge’s communal areas. Upon arrival Milton, the manager at Elephant’s Eye, mentioned that care is required: wild creatures have the habit of passing through the grounds. Concerns about the potential dangers of coming face-to-face with a lion or stepping on a black mamba were quickly outweighed by my burning desire for a cup of strong coffee. Shepherd, a powerfully built man, introduced himself to the group as our driver. Before departing he explained that Hwange National Park is home to a full house of Africa’s Big Five. That term came into being because lions, elephants, Cape buffalo, rhinos and leopards were regarded the five most challenging of southern Africa’s mammals to track on foot, so given special status by the game hunters of bygone times. Shepherd, our driver during a game drive from the Elephant Eye Safari Lodge. Hwange National Park was once a hunting ground for Matabele royalty. One of the reasons it exists in its current form is that the land was regarded unsuitable for agricultural use. Covering 14,651 square kilometres, it has an area greater than either the European nation of Montenegro or the state of Maryland in the USA. When the land was gazetted, back in 1928, it was called Wankie Game Reserve — the subsequent renaming has to be regarded as an example of successful rebranding? — and expanded into a national park upon absorbing Robins Game Sanctuary two years later. Antelope figure on the main gate at Hwange National Park. By the time we’d reached the park’s main gate, roughly half-an-hour drive from Elephant’s Eye, we’d already seen silhouetted baboons clambering on electricity pylons and the first of many southern yellow-billed hornbills. The bird’s sabre-like beak gives it a cumbersome, head-heavy appearance as it flies between acacia trees but proves effective in prising open seed pods for food. A spotted hyena, normally a creature of the night, glared at us from undergrowth. I couldn’t help interpreting his cold stare as a taunt at my inability to photograph effectively from our jolting, moving vehicle. Frustratingly, as soon as we came to halt and I could get a clean shot the animal sauntered out of view. A haunting, taunting look…the spotted hyena. The sun was low over the horizon by the time Shepherd started driving on Hwange’s sandy tracks, giving a golden glow to the foliage and abundance of birdlife we spotted. Small groups of francolins and guineafowl took turns to dart from the undergrowth into the path of the oncoming vehicle before scurrying, seemingly in panic, ahead of its slow-moving wheels. Wandering like a headless chicken? A grey francolin on a track in Hwange National Park. Intermittent rains fall in Hwange from February until April. The dense lushness of vegetation during the green season is a factor in mammal sightings being less frequent than during the dry season. Animals can find water throughout the park. For humans hoping to see wildlife and predators seeking prey, that has the disadvantage of meaning creatures don’t have to congregate at waterholes. As we drove, miniature mountains of dung provided ample evidence that some of Hwange’s 20,000 elephants had preceded us. A pugmark was proof that a big cat had also been by in recent hours. Pugmark on a track in Hwange National Park. Through the branches of trees we spotted the faces of a couple of giraffes. 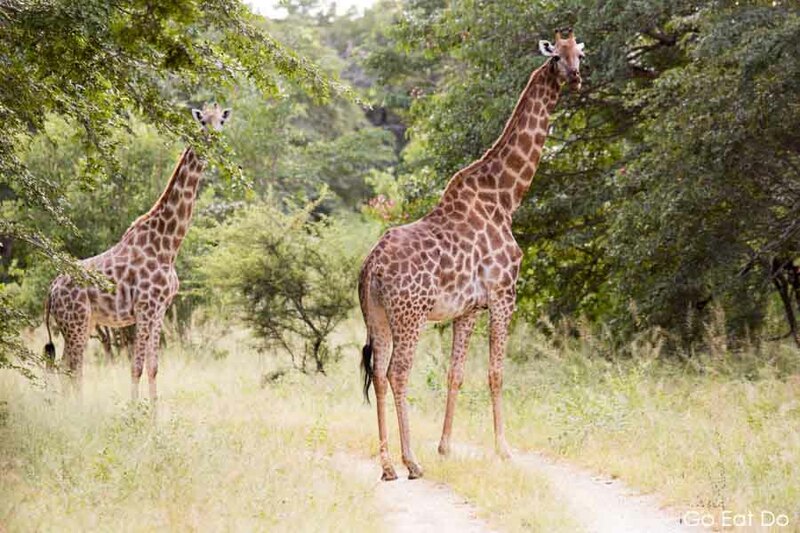 As they walked into a clearing our guide informed us that the collective noun for giraffes is a journey or tower. What is the term for people who think up such names? Worth a journey? Two giraffes in the bush at Hwange National Park. Shepherd pointed out a flock of Egyptian geese flying in the distance and a lone martial eagle wheeling in the sky. With a wingspan of up to 2.70 metres the raptor is the biggest of Hwange’s birds. Red-billed Francolin (also known as the red-billed spurfowl). He explained that a concentration of circling lappet-faced vultures indicated the likelihood of a kill in the distance. Unfortunately, the park’s population of vultures has decreased markedly in recent years, due to poachers employing cyanide to poison elephants for their ivory. Despite efforts to stamp out the practice, poisoning entering the food chain has resulted in numerous deaths of carrion birds. Lappet-faced vulture flying above Hwange. Even in the green season the greatest gathering of wildlife was around the water of the Nyamandhlovu Pan. From the viewing tower there I spotted wildebeest, a yawning hippo, impala, zebras plus a semi-submerged croc. After all of that, we were somewhat blasé about spotting waterbucks in knee-length grass on the way back to Hwange’s main gate. A male waterbuck on grassland in Hwange National Park. As we rolled along the tarmac back to Elephant’s Eye — and breakfast — I scrolled through my photos and nodded. The results weren’t at all bad given the time of year: the prospect of returning to Hwange National Park in the dry season is very tempting. Wildebeest, zebras and impala grazing in Hwange National Park. Find out more about Zimbabwe and its attractions via the Zimbabwe Tourism Authority website. The Zimbabwe Parks and Wildlife Management Authority website has information relevant to visiting Hwange National Park. Photography illustrating this post is by Why Eye Photography. Specialising in food, travel and portrait photography, Why Eye Photography is available for commissions across the United Kingdom and beyond. A grey crowned crane next to white-faced whistling ducks. Can you think of a wittier caption? If so, sent a comment. Stuart flew to Zimbabwe as a guest of Rwandair. Rwandair operates flights from London Gatwick to Harare via its hub at Kigali International Airport in Rwanda, with a brief stop in Brussels. Wild Frontiers (tel. 020 8741 7390) offers a 10-day group tour Zimbabwe, departing on 21 November 2018. The Land of the Smoke That Thunders tour takes in Victoria Falls, Hwange National Park, Bulawayo, Matobo National Park, Great Zimbabwe, Nyanga National Park and Harare. The tour costs £4,295 per person, including accommodation with all meals, guided excursions, transfers and services of a tour leader. Hwange National Park is approximately 2.5 hours’ drive south-east of Victoria Falls. The national park is roughly 3.5 hours’ drive north-west of Bulawayo, Zimbabwe’s second largest city. ‘Welcome to Hwange National Park’ sign. For wildlife viewing the best time to visit is during the dry season (from July into November). When the bush dries out it’s easier to spot animals, which tend to gather at waterholes. My though was ‘turn around please!’ A hippo yawning in Hwange’s Nyamandhlovu Pan waterhole. Elephant’s Eye (tel. +27 (0) 21 671 7729) is a luxury eco-lodge set on a 6,000 private concession adjacent to Hwange National Park. The resort is close to the town of Dete and 13 kilometres from the park’s main gate. Communal areas at Elephant’s Eye overlook one of two waterholes. That meant it was possible to view impala and warthogs while having a three-course dinner in the lodge’s open-sided dining room. Briefly, the resort’s compact pool was also used during that time: an elephant stopped by for a visit. The property’s elevated huts overlook a plain, meaning it’s possible to sit in the bath or relax out on the veranda while viewing animals and birdlife. I was informed that the waterholes at Elephant’s Eye have water throughout they year, making it a good place to view wildlife in the dry season. See the Hideaways Africa website for information about the availability of accommodation at Elephant’s Eye. 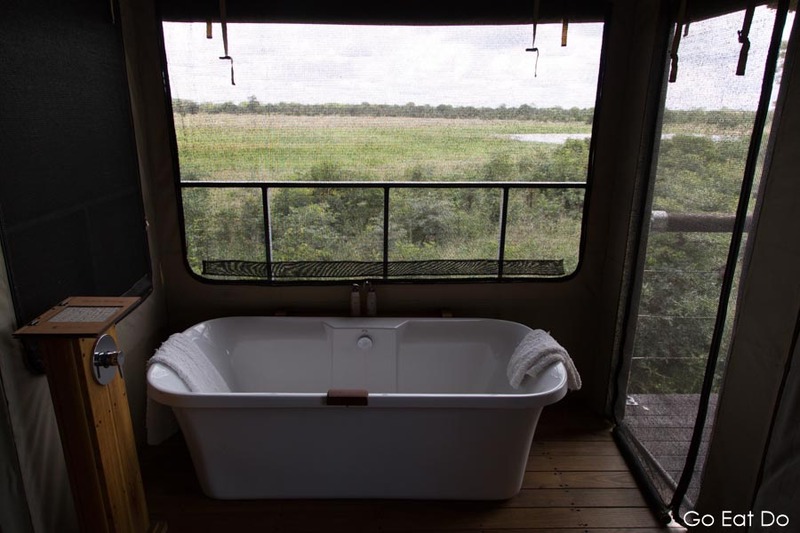 Room with a view…a bathroom at the Elephant Eye Safari Camp. Disclosure: Stuart toured Zimbabwe on an itinerary put together by the Zimbabwe Tourism Authority. This post contains affiliate links to books sold via Amazon. Previous Post Previous Article: Accidents when you’re abroad – what should you do? Thank you, Felicia. The park made a good impression and I noticed in Victoria Falls that people can take day trips to it, which may attract some travellers who are unable to stay in the vicinity of Hwange. Love your Hyena photo – it really is taunting you! As a photo it’s not my best but it was certainly a good sighting. Those creatures really do look mean. Looks like you spotted an impressive array of birdlife and a significant number of mammals while in the national park. Yes, given the season it was impressive. Seeing the hippo yawn was a personal highlight as I hadn’t spotted it in the water ahead of that.